The holiday parties are over for another year, and I am thankful. I love celebrating with friends and family, but the alcohol flows unchecked and I sink into it like quicksand. Before I realize I am in trouble, it is too late and I am stuck and drowning. Come back with me to December, and I will paint a vivid picture. There are twenty or more people crammed around a center island in the kitchen, and the boisterous conversation and laughter drown out the festive holiday music. The kids are supposed to be watching a movie in the basement, but they scurry through the sea of adults in what appears to be a game of chase. Their parents seem universally annoyed, but not enough so to leave their social circle and restore adolescent order. The island is covered in decorative holiday platters painted with snowmen and reindeer. The hors d’oeuvres include stuffed mushrooms, a fancy cheese plate, an abundance of sugar cookies, a veggie platter that is all but ignored and a crock-pot of simmering barbeque meatballs that bubbles quietly. The party revelers are all quite adept at balancing paper plates of appetizers and their cocktails in the same hand leaving the other hand free to pat backs, shake hands, give squeezy little half hugs and gesture expressively while telling stories. Spirits are high and the feeling of camaraderie and closeness is palpable among this gathering of friends and neighbors. I am enjoying my third beer – some dark winter-seasonal-porter microbrew with a hipster name and snowflakes on the label – when a couple arrives with a bottle of bourbon. Their youngest son is the same age as our oldest daughter, so we have known them for years as our kids attend school and play sports together. Richard apologizes for being late, and proclaims to all that since they can’t stay long, he is not messing around with beer. He opens the whiskey and invites everyone to enjoy a glass – or in this case, a red plastic Solo cup – with him. Moments ago, I was perfectly content with my two-and-a-half beer buzz, but I now feel compelled to join Richard in some bourbon on the rocks. It would be rude to make him drink alone, and he made clear that beer was for those with a lack of holiday spirit. “Pour me one, Richard!” I exclaim jubilantly as I slug down the rest of my porter with a look of antipathy. I am not the only one with a disgusted look on my face. I avoid eye contact with my wife, Sheri, who is staring at me from across the kitchen. I don’t need to see her to know what she is thinking. Matt – you promised to take it easy. We are both tired from a long week and plan to go home at a reasonable hour. The kids don’t need to stay up all night. Her telepathic urging does nothing to faze me. With that first sip of whiskey, I am all in, and this will be a night full of regrets and broken promises. As the half-dozen bourbon drinking men get louder and more obnoxious, the responsible party-goers offer holiday hugs and say their goodbyes. Eventually, there are just a few of us left and we are wondering where the party went and if there is any way to get another bottle of whiskey. Sheri gathers our half-asleep children and drags me out the door. My memories of the last hour of the party and what happens when we leave are hazy at best. I know it includes some curt and frustrated comments from me to my wife and almost no help with the children before I pass out somewhere in our house with a bag of chips and another beer by my side. Pathetic. The following day is full of strained thoughts attempting to put together the puzzle despite lots of missing pieces, and regret-filled apologies to Sheri. Again! I overdid it again! My sense is this is a story to which many of my Wash Park neighbors can relate. We have all overdone it from time to time. We have gotten swept up in the holiday spirit and the enthusiasm of friends and let booze lead us to places our sober minds would not otherwise have gone. It is harmless overindulgence. Mostly harmless…for most of us. For me, these episodes have grown to be too frequent and too dangerous. I am an alcoholic. This familiar tale of holiday cheer gone wild is a true story, but it is from several Decembers ago. I have been sober for a while now, and I have quite a story to tell. Admitting that I am an alcoholic publicly, not anonymously, is a very important part of the hardest thing I have ever done in my life – quit drinking. You see, I have never had a DUI or any other legal issues, my marriage is intact and my finances are stable. I have never lost a job or ruined my reputation or done any serious damage to property. For many years, these facts were a huge barrier between me and the truth about my addiction. When I thought about my heavy drinking, I would compare myself to the drunken bum sleeping in the gutter or the business woman who drank vodka in the morning to hide her shaking hands or the parent who couldn’t be bothered to pick-up his kids from soccer practice because he was firmly planted on a bar stool for the evening. Those people are alcoholics. Because, “I was not as bad as them,” I could not see that I suffered from an addiction to a highly addictive substance. Like almost all alcoholics, I made drinking rules that I struggled in vain to follow. No drinking on weekdays, no hard alcohol and a limit on the number of beers I could drink were all feeble attempts to control the uncontrollable. I tried. But inevitably, often enough, I failed to stay in bound and I broke my self-imposed restrictions on my drinking. When my permanently alcohol-warped brain would have glimpses of honesty and I would try to quit drinking, the shame would overcome me. Sure, I was ashamed of my lack of control when drinking and the petty arguments that it sparked with my wife, but the shame of sobriety was even more intense. 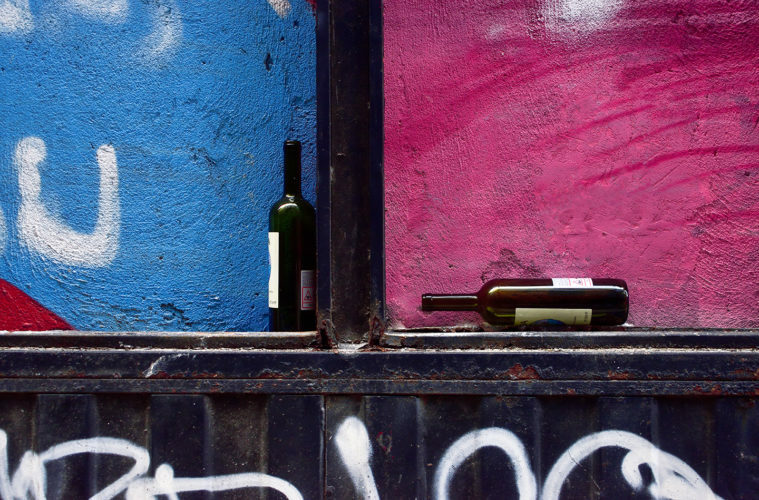 What sets alcoholism apart from addictions to other drugs is that alcohol is ever present in our society, and certainly in our Wash Park neighborhood. Not only is alcohol everywhere, it is socially acceptable – even celebrated – where other drugs are disparaged or forbidden. Everything from a four-year-old’s birthday party to a Denver marathon watch party includes beers or Bloody Marys or mimosas. When every social gathering includes booze, and you are the only one abstaining, sobriety carries with it quizzical looks and lots of questions from friends and family. My sobriety filled me with shame. I was ashamed of my disease. I was ashamed that I wasn’t normal like everyone else. I was ashamed that I couldn’t just have one or two and go on about my day with a sense of contentment. And I was ashamed of the drunken behavior that led to my need to quit. There is no greater barrier to a high-functioning alcoholic finding peace and a cure to the disease of alcoholism than the shame of sobriety in an alcohol-soaked world. Through an abundance of research and reading, lots of writing, some heart-felt sharing and plenty of praying; I made it out. I beat my addiction. At long last, I am sober and unashamed. Now, it is my mission to share my story and help people like me come to grips with alcoholism and find a way out of the grip of the shame of sobriety. I will not try to convince moderate, social drinkers of the evils of alcohol, nor will I urge legislation or protest events where alcohol is served. I will, however, encourage open and honest communication about the largest and deadliest disease of our own invention and proliferation. There are over fifteen million alcoholics in this country, yet addiction to alcohol is largely misunderstood and considered a family embarrassment – something to be frowned upon and whispered about in privacy. If removing the shame associated with this disease is the key to its cure, don’t you think it is about time we start to talk about it? Please visit my blog, SoberAndUnashamed.com. There I tell the full story of my high-functioning alcoholism in all its despicable and despair-filled detail. Check it out if you think your drinking might be leading to trouble in your life. Check it out if you have a loved one who suffers from alcoholism (we all do whether we know it or not). Check it out if you are my friend and you want to understand what I have been through (your support starts with understanding my story). Check it out if you are just curious about the distress of your neighbor – curiosity is human nature. Please subscribe to my blog at SoberAndUnashamed.com. If we ever hope to cure this very curable disease, having an open, honest conversation about it is a requirement. Your subscription to receiving emailed blog posts tells me that you – even if you are absolutely in control of your drinking – care enough to understand alcohol addiction and want to help find the cure. When one of our neighbors is diagnosed with cancer, the outpouring of support is overwhelming. When one of our neighbors announces his alcohol addiction, the silence is deafening. As your friend and neighbor, I know that you won’t know what to say when you see me around the neighborhood. How about this? Maybe give me a smile and a handshake or a hug? Maybe just thank me for writing? Maybe tell me you subscribed to SoberAndUnashamed.com? I will smile back and thank you for reading. A hug, a smile, a handshake and an acknowledgment that you know…that sounds like the start of a lifesaving, disease eradicating conversation to me. Thank you in advance for becoming part of the solution.